All of our Thanagan Bowl Blanks are made with the best quality hand selected kiln dried hardwoods available. 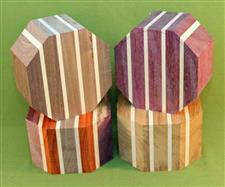 We have tried hard to put together some awesome bowl turning blank sets at a super price. We use the highest quality FDA approved glue. Blanks are individually inspected and come with our 100% Satisfaction Guarantee. Safe Turning. Check back often as we will be adding more great bowl sets soon.